A woman in Miami put up half of a 10-year-old grilled cheese sandwich for sale on eBay and claimed it bore the image of the Virgin Mary. Even more astounding, the sale was viewed over 100,000 times and garnered a bid of $22,000 before eBay pulled it off the site. The woman said she took a bite after making it 10 years ago and saw a face staring back at her from the bread. She put the sandwich in a clear plastic box with cotton balls and kept it on her night stand. The sandwich has never sprouted a spore of mold. It is a sad state of affairs when people believe that they see the divine in food. Well, I guess when I eat a delicious In-n-Out Burger I feel like I am almost talking to God, but that’s not exactly the same thing. Selling a half-eaten sandwich on Ebay is not only only gross, but a whole lot of crazy. I certainly hope that this woman uses her proceeds from the sale, if any, to get the professional help she needs. Big ups to Steve Thompson for sending me the story. Actually, the sandwich was not deemed a joke by eBay and put back on the site. Apparently after speaking with the woman, eBay investigators realized that she believes her own crazy and is willing to part with the sandwich in exchange for money. As of this writing, the item has received 16 bids with a high bid of $69,100. Of course, there is no way of telling how many of these bidders are “serious” bidders. I’ll venture to guess that they are all between 12 and 15 years old. Stay tuned. I’m hoping to create the world’s first skeptical relic – an object of no value, no purpose & no intention of convincing anyone of anything. You can help – visit the auction listing. View the video. 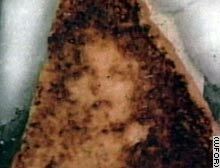 I want the Real Fake Bigfoot Print to become at least as famous as the Virgin Mary Cheese Sandwich.